Each and every member of the Cummings School faculty brings a unique combination of experiences, knowledge and motivation to their students. 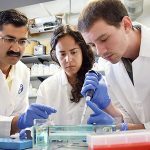 For Akram Da’darah, MS, PhD, a molecular biologist, it’s his love of laboratory science, the opportunity to solve everyday challenges in the lab and ability to impart his real-life lab work to Cummings School students that inspire him. The MSIDGH journal club gathers for its last meeting with Dr. Akram Da’darah on 12/16/16. He recalls at a young age having a strong interest in engineering and medicine, but, “one step at a time,” is how he describes his path to becoming the scientist he is today. Most striking, though, is Dr. Da’darah’s zeal to learn. As a biology major at the local university in Jordan, Dr. Da’darah’s passion for science and intellectual curiosity grew, especially as he delved deeper into laboratory science and new laboratory techniques. He was pursuing a master’s degree in the field of cell biology and cytogenetics when he recognized the role he could play in developing therapeutics that have the potential to control disease at the molecular level. 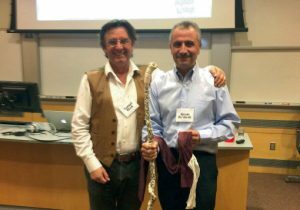 Dr. Akram Da’darah was elected to serve as the President of the “New England Association of Parasitologists” (NEAP) for a two-year term (Nov. 2017 to Nov. 2019). Here, Dr. he receives the Staff of NEAP (a wooden tapeworm) from the immediate past-president, Dr. Sam Black of UMass, Amherst. 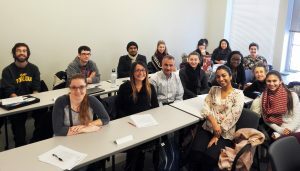 Lacking the opportunity to pursue doctoral studies in his native country, Dr. Da’darah sought programs elsewhere, landing a scholarship to Bernhard Nocht Institute for Tropical Medicine/Hamburg University in Germany. There, he met the challenge of learning a new language with the same eagerness as he did for his molecular and biochemical parasitology studies. Remarkably, in just a few years, he wrote and defended his thesis in German. It was also at Hamburg University that he developed the solid foundation in parasitic and tropical diseases that is the basis for the work he continues today. 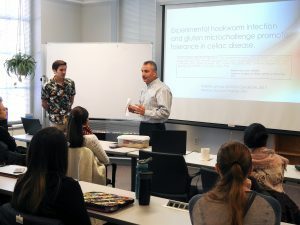 When the HSPH research lab relocated to Georgia, it was Dr. Da’darah’s significant expertise in schistosomes that grabbed the attention of Cummings School colleague Patrick Skelly, PhD. 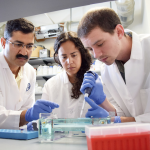 In 2010, Dr. Skelly recruited Dr. Da’darah to join the Cummings School research team working on this neglected disease. 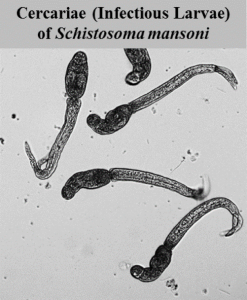 The infectious stages of schistosome parasites. The question at the center of their research is how adult schistosome worms manage to escape the immune system without raising an alarm. The answer to this question could lead to new drugs or vaccines to treat or even prevent schistosomiasis. Having contributed to two vaccines currently being tested for transmission reduction of the disease in animals, Dr. Da’darah is actively in pursuit of additional new pathways to prevent and control the spread of this disease. Dr. Da’darah strives to prepare students for real-world scenarios that they may experience post-graduation. 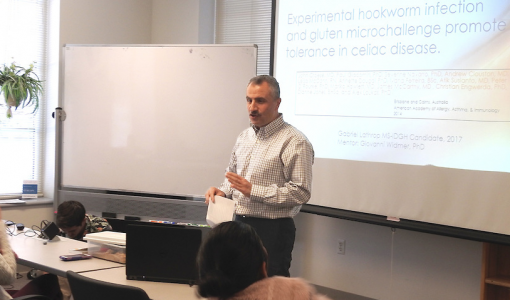 As one of the primary faculty members for the Master of Science in Infectious Disease and Global Health program, Dr. Da’darah brings his 20-plus years of experience with molecular biology to the coursework he teaches. His goal is to prepare students for real-world scenarios that they may experience post-graduation. “He is an excellent mentor who puts his students first. We spent many hours reviewing journal articles until I thoroughly understood them and hours where he evaluated and critiqued my presentations. He is an expert in his field and his expertise is eloquently conveyed through his teachings,” says Leena Suppiah, MSIDGH ’16.